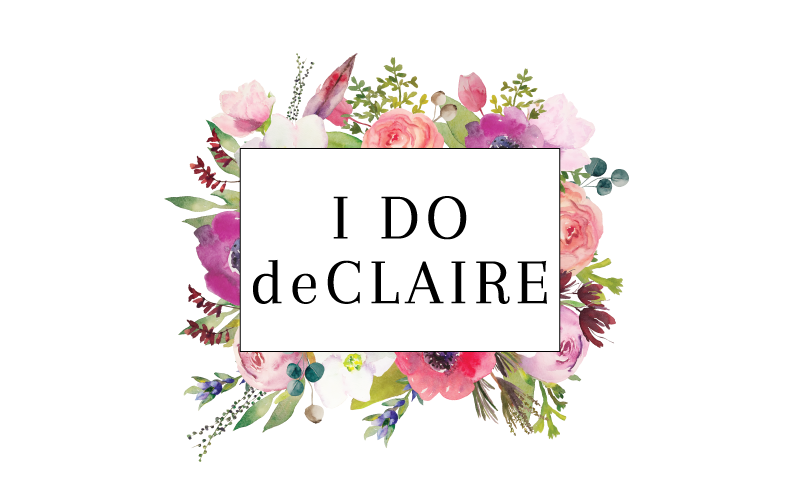 I do deClaire: Same. Stinking. Outfit. I was so excited about this outfit. The textures and patterns are interesting together without being too bold. It was an outfit I actually packed for a short trip around Christmas time when we went to see my in-laws. I thought I was being so efficient with packing and only packed two outfits for two days. It didn't even take me long to get it all done. Our last day there, I came out of the bathroom dressed in this while Matt was laying out his clothing for the day... Same. stinking. outfit. I am serious. 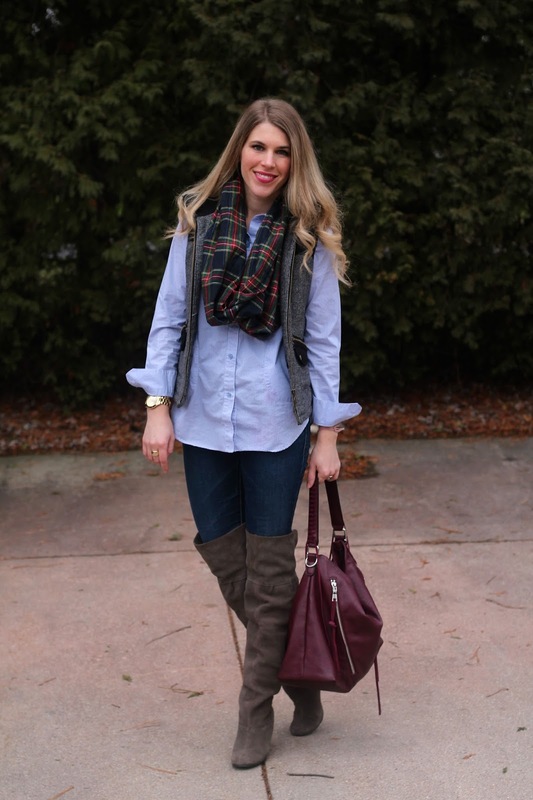 Striped shirt, jeans, and tweed puffer vest. Given the fact I didn't pack any extra clothing and Matt didn't either we were stuck. Are you inadvertently dressing the same as your spouse? It's probably just a sign you've been happily married almost 10 years! Haha that's too cute! I hope you took a picture together! That's so funny! 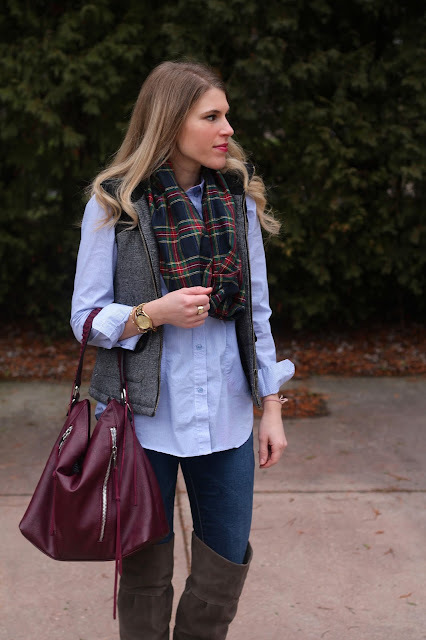 My husband and I both have a red and black plaid shirt, and black puffer vest, so we have to be careful there. 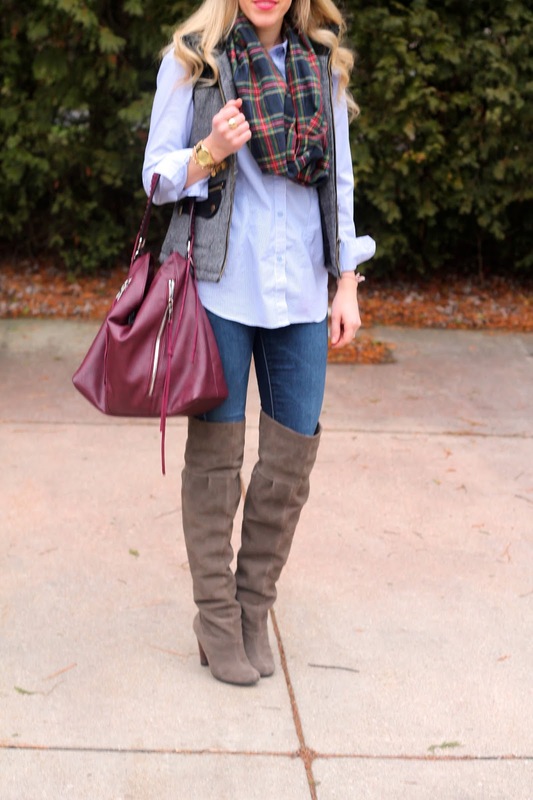 This is the perfect winter outfit girl, and those boots are killer. I have done that with my husband as well. We did an all denim night. :) Love this look and that bag is awesome! haha i love the story--and i see why! it's a great outfit. Awww! That's adorable! Also, can we just discuss how amazing your boots are?!?!? Holy moly! That is too funny! I bet you all looked so cute together. ;) Russ and I have come out in chambray or plaid shirts at the same time before. Great look! I love this whole combo! 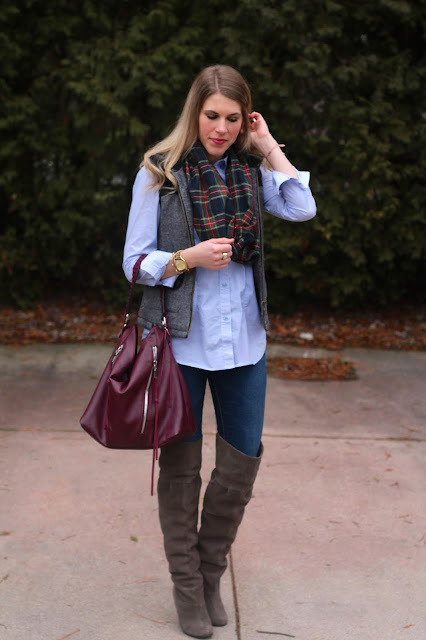 The scarf, vest & button up are all perfect! Haha, such a funny story! You should have included a photo of the two of you as twinsies! Love it. I really love your OTK boots! Hahahah that's amazing! You guys have some serious telepathy going on. 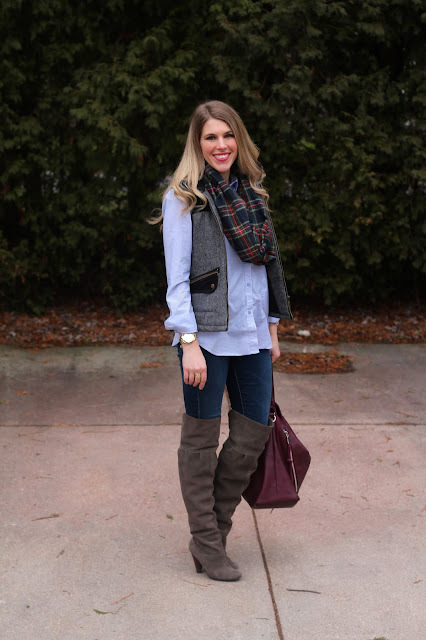 I love the combo of the patterned vest and plaid scarf! I knew your blog browsing fashion sites and I was in love with your style. 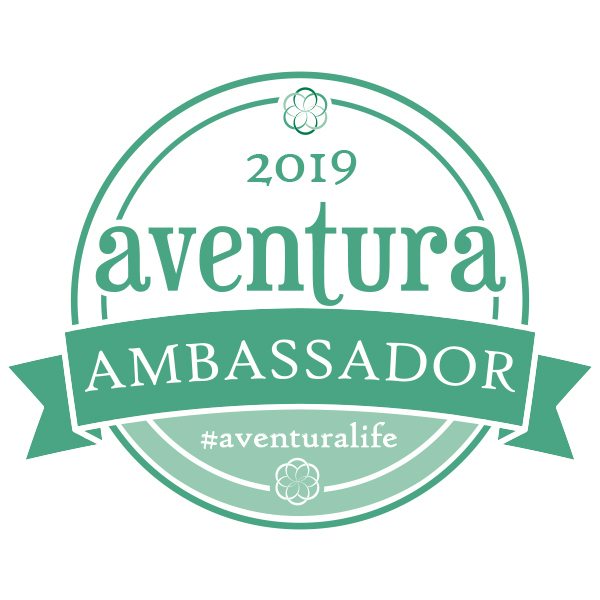 YOUR BLOG IS SO AMAZING! And you are a beautiful woman! All your looks are simply fantastic! You are an inspiring and superbly elegant woman. 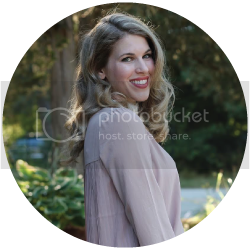 My name is Aline and I´m a Catholic fashion blogger from Rio Grande do Sul, the most Southern brazilian State, without the stereotypes that sell from Brazil to other countries. In Rio Grande do Sul, have cold, snow, more Argentine and Uruguayan culture, the gaucho culture. Well, you can see Rio Grande do Sul is similar to Kansas, Virginia, Georgia, Missouri, Texas, Arizona and the West and the South/Dixie in USA. Our gauchos are the US cowboys. So, your look with boots is very SPECIAL for me. I'm a rural woman! Wife and mother of 4 children. I'm a lawyer and teacher also. So simple yet so chic! Love everything about this look, esp that scarf! Haha! I hope you took a picture! I love this layered look! Those boots are amazing! That is pretty adorable that not only do you own similar pieces, but that you both packed them and then wore them on the same day. Adorable. I'm obsessed with this whole ensemble. Love that scarf!! Great post! Cute look! Loving the vest paired with that plaid scarf. And cute story! My sister and her fiance often dress alike without trying. Such perfect combo of outfits :) lovely ! That just means you both have good taste!